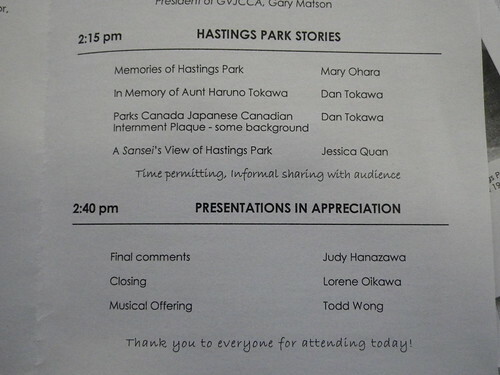 Vancouver Heritage Foundation had a ceremony on Dec 1 to recognize the Livestock Building at Hastings Park, an important part of Japanese Canadian Internment History, as one of Vancouver’s Places that Matter. 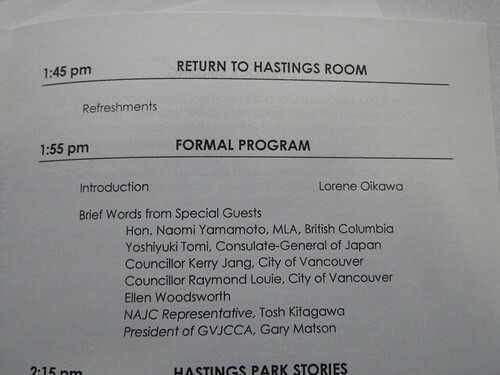 At 1pm, everybody met in the Hastings Room, and MC Lorene Oikawa, told people the order of events. 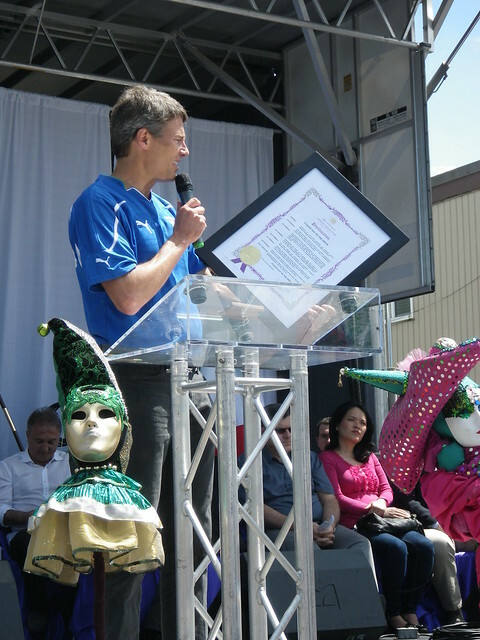 We would do a walk to the Livestock Building for an unveiling, followed by a walk to Momoji Gardens for a Parks Canada unveiling. Finally we would return to the Hastings Room for formal speeches, personal stories, and presentations in appreciation. 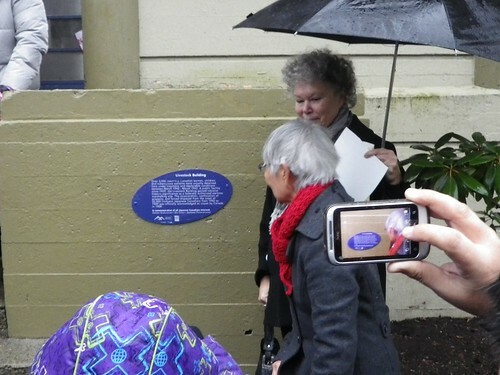 Marta Farevaag, Chair of the Vancouver Heritage Foundation, watches as Mary Kitagawa steps back from unveiling the plaque for the Livestock Building at Hastings Park. 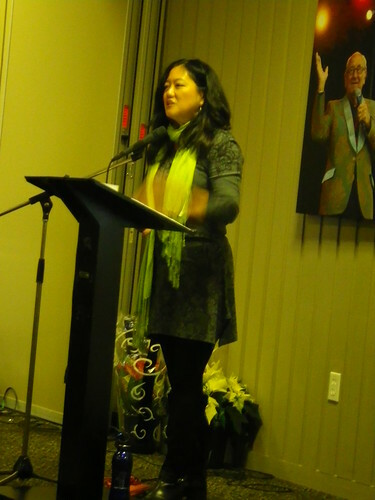 Watch this video of Mary Kitagawa speaking about the detainment and internment of Japanese Canadians during WW2. Roy Miki, Japanese-Canadian Redress co-leader and author stands at the top of the stairs in long dark coat and white hair. 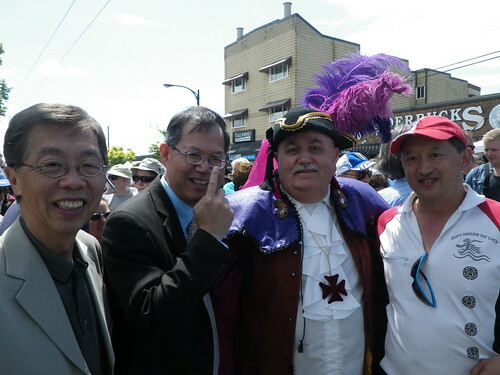 Chinese-Canadian historian/author Larry Wong stands on the stairs in rust coloured jacket. 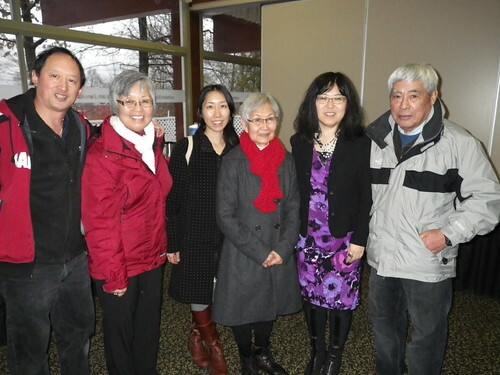 Lorene Oikawa, union leader and human rights activist stands on the right in red coat. 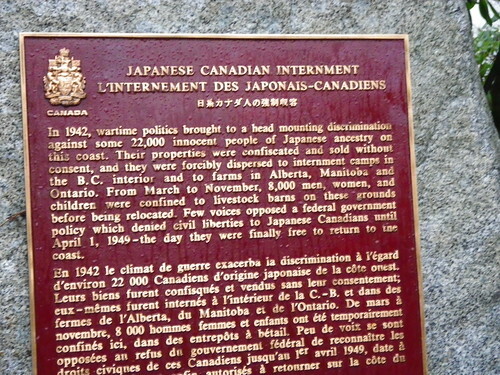 The Parks Canada plaque at Momoji Gardens was re-located for better public viewing, and unveiled. 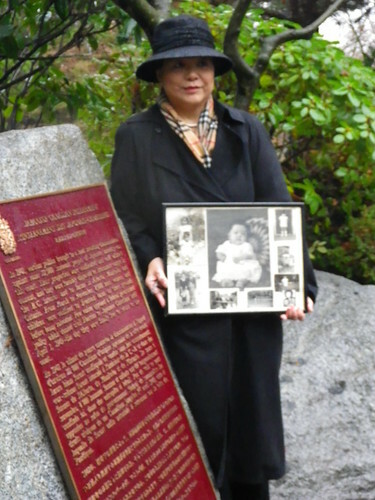 One of the event attendees shares a personal moment, as she stands beside the plaque with photos of family members. Naomi Yamamoto MLA, is the first Japanese-Canadian to be elected to the BC Legislature. She shared a story how her father had spent 5 months living as a detainee at the Livestock Building. Naomi explained that because her father was an older teen-aged boy, he was separated from his mother. His father had already been separated from their family and sent to a labour work camp. 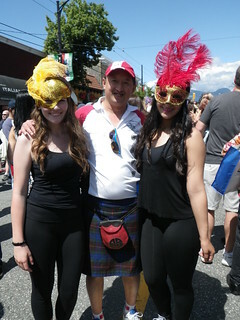 Unfortunately, her father could not attend the ceremonies on Saturday, due to not feeling up to it. “Mary Ohara’s story resounded. She told of her incarceration in March 1942 in the livestock barns at Hastings Park, still reeking with manure and infested with bugs. Birds flew overhead and fouled their blankets. Bedbugs bit at night, and the administrators brought in DDT and sprayed the bedding, including the blankets under which the children would sleep at night. 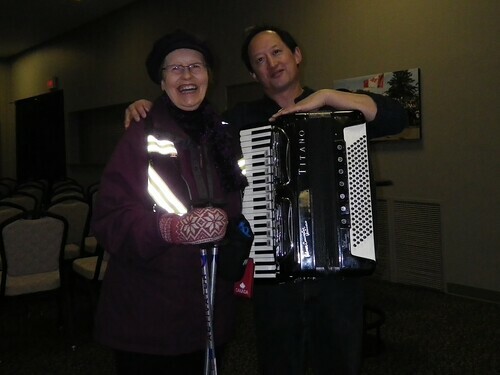 My friend Inger Iwaasa and my accordion. 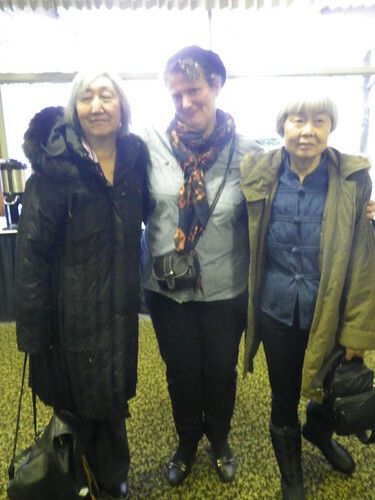 Inger married a Japanese Canadian, and her daughter is pianist Rachel Iwaasa, who performed at Kogawa House for the presentation when Joy Kogawa was named recipient of the George Woodcock Lifetime Achievement Award. Inger said she recognized each of the songs that I performed: Sakura, Mo Li Hua (Jasmine Flower), O Solo Mio, Neil Gow’s Lament, Hungarian Dance No.5, Dark Eyes. 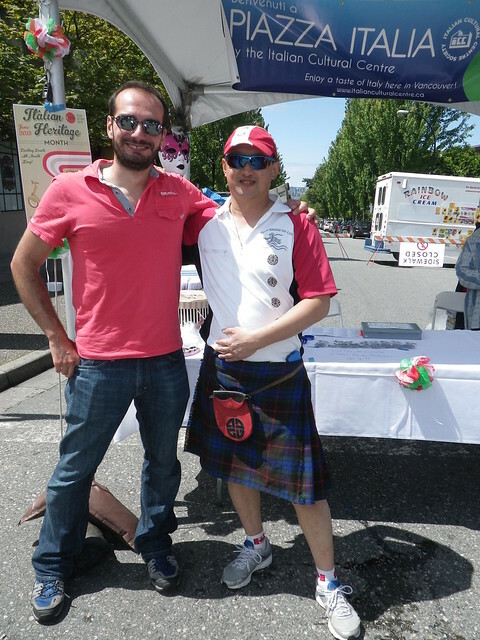 I wanted to perform a mixed repertoire that would represent many of the ethnic groups that had come to settle in Vancouver: Japanese, Chinese, Italian, Irish, Hungarian and Russian. 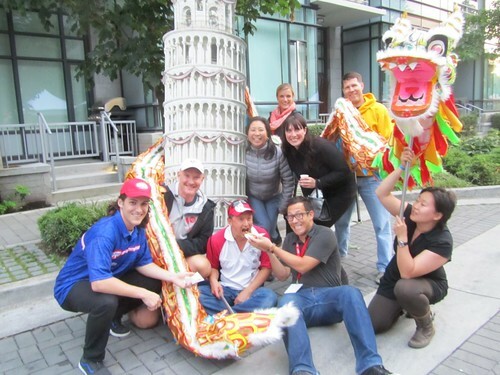 Todd Wong, Judy Hanazawa, Jessica Quan – special projects coordinator VHF, Mary Kitagawa, Lorene Oikawa, Tosh Kitagawa. This entry was posted in Canadian Identity, Canadian Identity & Heritage, Joy Kogawa & Kogawa House, Todd Wong, Uncategorized, Vancouver Heritage & History, Vancouver Heritage and History on December 2, 2012 by admin. 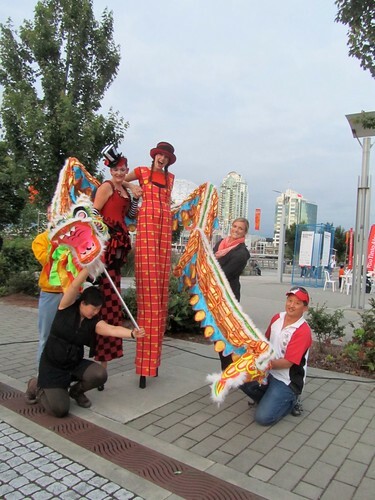 Kudos to Barbara Lee, Grace Chin, Kathy Leung, and the Vancouver Asian Film Festival (VAFF) gang on putting on such a wonderful show on opening night. It’s risky business to follow up with a hugely successful Surrogate Valentine, which brought audiences to their feet last November 2011 in applause and cheer, with a sequel which might or might not live up to expectations. Rest assured, VAFF wisely selected a winner for an opener. It was eerie, as Daylight Savings brought the same smiles to the faces of audiences. 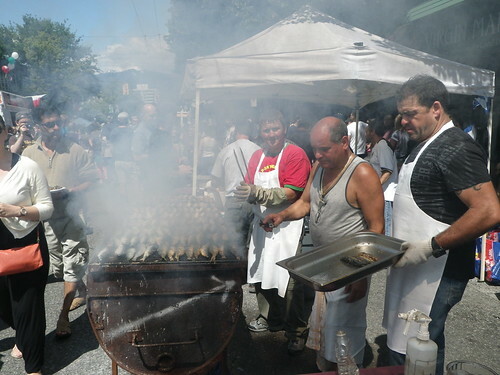 What a great way to open a festival. Goh Nakamura and Yea-ming Chen gives a remarkably funny and touching performance in Daylight Savings as two hurt lovers in search of themselves. Just as Goh gives up all hope for love after breaking up his girlfriend,The Professor, he is instantly captivated by Yea-Ming at a house party. Chasing after destiny, Goh begins his journey on a wing and a prayer to find her Las Vegas with the help of his screwball cousin Mike and junkie Will. They meet, they fall in love, they make love – Yea-Ming is everything Goh believes he wants in life. Yet he is never quite able to leave his baggage behind as he still holds onto his girlfriend’s plant. Leaving us to wonder at the age old adage of love is all about timing. The second feature film, Bleached, was a surprisingly witty but heart-wrenching film about a love-struck Filipino-American teenager, Lenny who gives in to becoming a guinea pig model to skin-lightening cream given to her by her vain, image-obsessed mother. Only to discover a shocking twist. 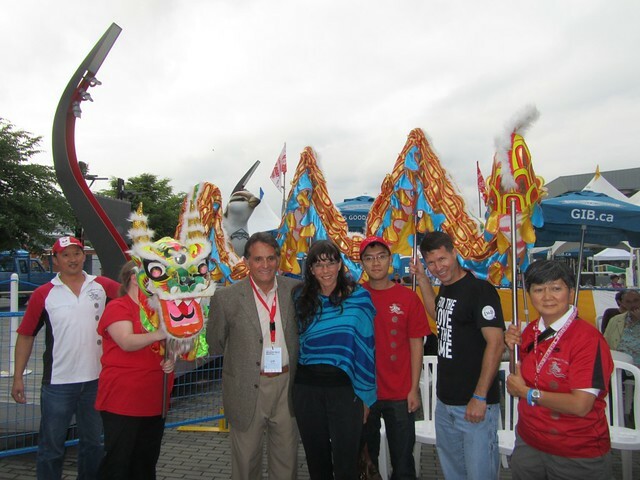 VAFF’s founder and President Barbara Lee was on hand at the opening to welcome friends and supporters of VAFF. The after-party at the Kentizen was rocking with celebrities, friends, and community supporters. We caught up with our good friends over the years, including Grace Chin, who has become this year’s Festival Director, Kathy Leung (author of Red Letters, Mark Oh (VAFF 2012’s Volunteer Director), Iven Tse (VAFF board member), Peter Leung, Winnie Tam, Patricia Lim (Ricepaper Magazine) Callan Tay, Gavin Hee (MAMM Sponsor), Mark Lee. The party began with a celebration of the sweet-16 celebration cake cutting at the Kentizen Fusion Lounge, followed by a beautiful night of musical performances by Goh Nakamura and Yea-Ming Chen. Barbara Lee has been a bastion of strength and perseverance in the sixteen years of VAFF’s history. 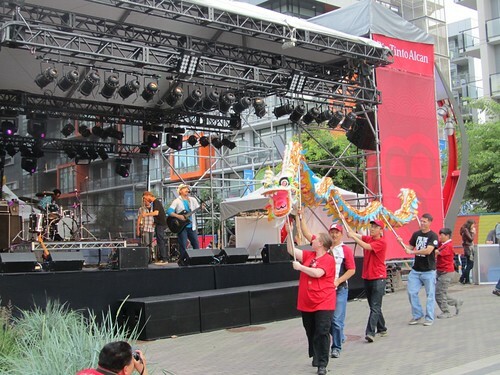 Starting off with a dream to start a small film festival, VAFF has grown to become a cultural mainstay, featuring the who’s who in the Vancouver community, and has spawned offshoot festivals across the city. Congratulations to you, well done! 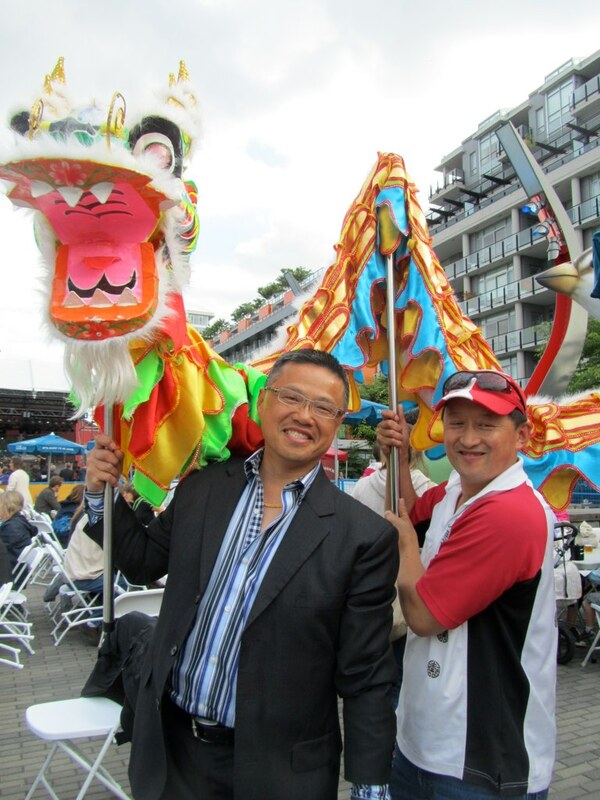 This entry was posted in Asian Canadian Cultural Events, Uncategorized, Vancouver Heritage & History on November 2, 2012 by allancho. Ernest Lee and his bride Kate Chan Lee had their wedding day photo taken at the Hollow Tree in Stanley Park. Accompanying them for the pictures was Kate's mother Mrs. Chan Yu Tan, and her youngest sister Millicent.